After reading this thead i just wish to confirm that my thinking is correct on earthing the screen of the signal wires in the control box. The photo shows the first screen wire in position from my interface board to the Gecko. The correct way is to twist the screen wire at the gecko end, crimped it to a piece of wire with a connector and lug and then screw it to the heat sink. The other end of the screen wire must be trimmed short. Lex, that is about right, but you might be able to crimp a lug directly onto the twisted braiding at the gecko end. (It will be clumsy to have a connector and wire before the lug). You drill and tap the alu plate to suit the lug's position. Dankie vir die raad. Ek sal so maak. Ek is lekker dom met die bedraading! The above picture shows the grounding done to the main frame - the wire through out is 2.5sq mm. The above pic is of grounding for the Z - the bolt which is used to mount the spindle clamp is used. also is it necessary to provide for grounding jumpers from those done near the motors to the motor mount plates on the gear boxes.? Last edited by javeria; Sun 26 April 2009 at 08:40..
You grounded both ends of the gantry (pic 2 and pic 4 above), which is something that I have not seen before. Normally we only ground one end. It is not usual to ground the motor plates, but that is technically a good idea. I don't know if you cleaned off the blue paint under the ground connection, or if you used a star washer, or both? I scraped the paint using a broken hacksaw on the bolt holes - except for the other side of the gantry - I could not reach for the broken hack saw (it was beyond my arm's reach at that time) however I have measured the resistances and 1.2 to 0.3 everywhere. I happen to play with cars some and an auto elec. told me the worst enemy of of a ground is rust! First thing I do on old cars is rebuild the earth circuit, it's amazing just how much better they run. Just hope I connect the right wires on the MM! Maybe it was a little premature to rat out on the SS. In addition to that, he told me to add an EMI filter on the power input to the VFD and a toroidal ferrite on the motor output as pictured below. The IEC cable filter was the only one i could get off the shelf at my local electronics store. I will change this to a normal spade terminal one and neaten the wiring. But this has fixed my SS problem and i no longer lose comms with it!! It was so much fun driving the table around with the spindle going. I need to finish my water circuit for the spindle but should be cutting in the next couple of days when i get a chance! Matt, I have also recently started becoming aware of alternative strategies for grounding shields. What is coming through is that power cables (motor or spindle cables) should be grounded both ends, while signal cables (the milliAmp stuff) should be grounded one end only. We have added ferrite rings on the input and output (2 rings) of our VFD - it is recommended in their handbook. But, what really got our SS going was routing the USB cable far away from anything else. Anyway, great to hear that you have reliable movement! Now we want reliable sawdust! After looking at paul60 ( woodguy) photos on his controller works, (now above) I’m worried about his cable shield connections. Is it my imagination cross referring some of my zillon post reading . Shouldn’t those Geckos be left alone ! I can’t find the post where I thought I read it was no longer recommended to attached the cable shield to the Geckos heat sink alu plate, minimizing noise among others to those drives ? I can’t find the post where I thought I read it was no longer recommended to attached the cable shield to the Geckos heat sink alu plate, . . . I don't remember any such post, nor do I see anything wrong with the photos above. . . . . . . When the load picked up on the spindle the connection between the Smooth stepper and the BOB was lost. I found that the shield on the cable power supply to the motor from the VFD was connected at both ends which eliminated the shielding and locked up Mach3 and the ss. Only connect one end of the shield cable to ground and it works fine. I'm sure that some one has stated the shielding connection on one end before. That is about as far as I have gotten. Have you had any luck on the breaking resistor? you would usually connect shielding on the end that 'sends' the signal. in this case it would be the VFD, then shield at the motor end would then be left open and not connected. Thanks, Ries - I am backward to that. The shield is at the motor end. I will change that tomorrow. EE engineers always say ground the shield at the source, but in fact if you can't do that for any reasons, grounding at the load end works as too. What we need is a Faraday's cage to take effect, the shield being metal conductor hence the cage & grounding at one single point will turn it into a faraday's cage. may be the motor itself will not suffer from ground loop problems, however the rest of your electronics, specially micro electronics (PC, BoB, Drivers) might suffer from a more dirty ground, remember that the 'ground' and the loop has a much higher impedance at these frequencies generated by the spindle + steppers then you would measure with your Ohm meter. Most important is not to ground any cable of the Bob/PC/Printer cable, anything before the Gecko with any ground plate or ground that is found within your control box. The PC and BoB needs to be separated from ground, because the gecko drivers are opto-isolated. However, it's true that you can make complete studies out of this and EM in general, what will work for some, might not work for the other (obvious there are general rules to follow). I did notice that the overall system we use is not very sensitive to EM (I don't have experiences with spindles though). My system is well grounded throughout the system, however due to my cable restrictions in Ecuador, I don't have any shields on my cables and everything runs (so far) just fine. Tomorrow I will have a call with my bro if he is at home, he did study this stuff a bit and has been designing similar systems (although with higher amps). @Ken: Faraday talks more about discharges (like thunder strikes a car, and you are suppose to be safe) then antenna systems. In our case we basically talk about lowering the impedance for signals of higher frequencies that are unwanted within our system and leading them away, it's more closer related to antenna and coil/resonance systems then faraday. In summery when you have a loop of wire or metal strip that is very slender, (Shield of the shielding cable is slender as the length is very long with respect to its diameter or width), it become an antenna. In these circumstances the effect of a long single-ended shield is a better antenna than a dual ended shielded cable. -EMI suppression filter on power input to VFD. My bro is an electrical engineer that had to deal with similar issues, but with larger and different installations in the past. The most important reason why we ground is because of safety. That means, if you have a VFD and ground only on the VFD side and it works, then this is fine as long as the situation is safe. If this is somehow not safe, then make it safe, if that means the spindle need to get grounded through the VFD cable, then make sure you don't get ground loops through the cable and machine that can cause hum/buzz. Basically the ground we have is a dirty ground, and we don't have a clean ground in our controlbox. We could create a clean ground but with only the BoB that is opto isolated and goes to the PC this is not really a issue. You could even say that the ground of the PC is clean and basically the GND of the BoB is connected to that (as far as I know through the printer cable). For this reason it's not a good idea to connect the GND of the BoB and PC to anything in the case. in my case no cable is shielded because I cannot get such cables here and everything works fine so far. Only the low signal cable from BoB to Gecho is 'shielded' but Shhhhhhtttt between you and me, I didn't attached it to teh BoB. I need to test still while Jairo is welding in the workshop while the machine is running. ...What is coming through is that power cables (motor or spindle cables) should be grounded both ends, while signal cables (the milliAmp stuff) should be grounded one end only. Gerald according to your post, (and Matt's), we should ground the VFD -> Spindle cable at both ends. So far so good. a ground wire is allready connected to the y-car from the z-zlide which ends at the control box (Alu Plate under Geckos). Isn't this wiring method causing a ground loop or i see the whole picture in a wrong way ??? 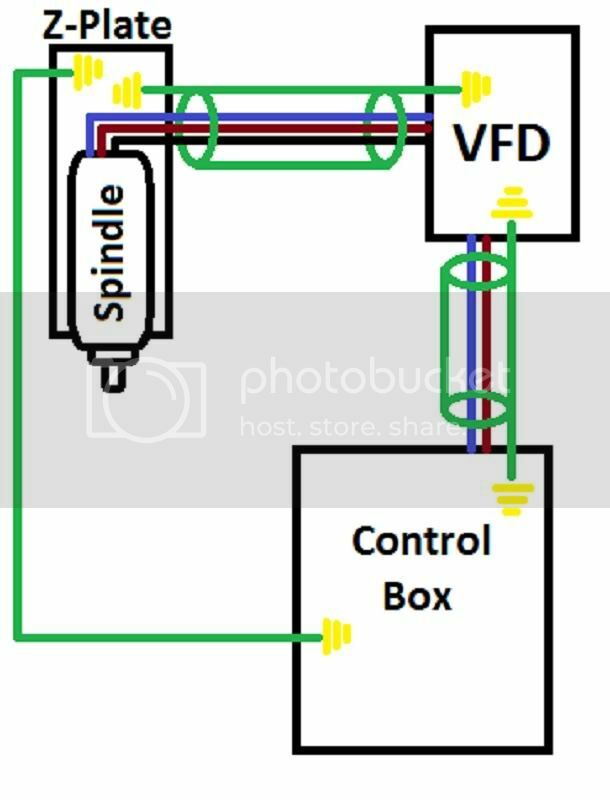 What about the cable from the control box to the VFD shouldn't be connected at both ends or not, and if not why should we connect the VFD--> Spindle cable at both ends since it's going nowhere ?? And how about the motors (OM) ?.Should they also be connected at both ends or they considered to be in the milliAmp catecory ?. Last edited by Sergio-k; Sat 17 April 2010 at 06:58..
Sergio, our systems are grounded one end only, but I hear sometimes that people solve problems by grounding both ends of "heavy" current screens. I think it is a good idea to connect them at first, and possibly disconnect later. . . . that is easier than trying to connect a screen that has already been cut back. I'll try the one end grounding and see how it goes. It doesn't matter if you break through on the anodizing. First off it's Mil-grade hard anodizing which is different than ornamental anodizing. Mil-grade anodizing must pass a 3kV hi-pot test and we do hi-pot the plates for quality assurance on the side that matters, the top side of the plate where the MOSFETs go. Because you cannot selectively anodize the plates without using pointless masking, the whole plate gets anodized with fine quality Mil-grade hard anodizing. The plates are shorted to ground internally (to Term 1) via the mounting screws. You don't bust through the anodizing and everything is OK or you bust through the anodizing and everything is still OK. The only time something exciting happens is when someone loses the GND connection to Term 1 and has partially busted through the hard anodizing. Then ground path currents through the chassis try to complete the path to the drive via the chassis to the plate. The drive was never stressed. It lost the wire connection from GND back to the power supply. If the anodizing was busted through, current found its path back via a low quality short to the chassis. Sparks, arcs, smoke and a lot of excitement but little else. If the anodizing wasn't cut through, the drive just wouldn't power up. Far less exciting that way. Moral of the story? Make sure your wiring is good. End of story. I am after some Flexable earthing cable any ideas?... I can only find solid strand earthing.